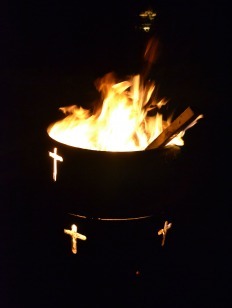 Each year the Holy Name of Jesus Parish hosts a 48 hour watch-fire from Holy Thursday through till the start of the Easter Vigil.This watch-fire is tended by volunteers and groups who pray, sing, watch and wait together in shifts throughout the day to sit by the watch-fire. This is a wonderful time to meet other parishioners, fellow members of our council, and their families. We ask and encourage you as a brother Knight whether a member of our council or another to join us for this hour event on the lawn between the old church and new church.